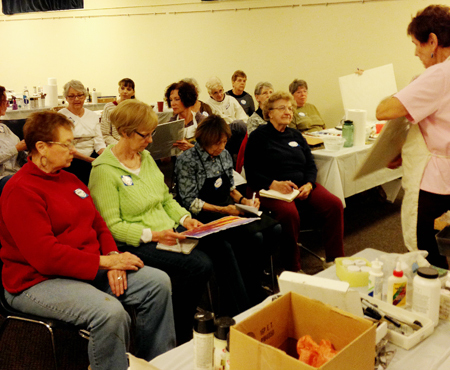 We had a very large turnout for Phyllis Vandehaar’s Mixed Media Workshop – Experimenting with Webbing, Watercolor & Collage. Many of the workshop attendees were not familiar with watercolor so the day was full of experimentation, some frustration and, finally, happy paintings. 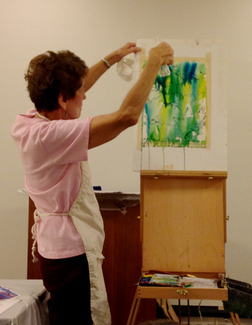 Phyllis is known for incorporating “webbing” into her paintings. Webbing comes in a spray can in black, gold and silver. The black color is the easiest to use. Phyllis took us all outside with our paper and spray can and demonstrated the technique she uses. 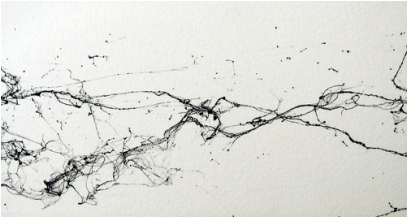 She lays her watercolor paper on the ground and sprays the webbing about 8”-12” above it in a forward movement so it can drift gently down onto the paper. The result is an abstract spider web-like effect. Despite the gusting wind moving the papers around and the concentration of goose poop, we had a great time. The webbing dries almost immediately so by the time we got back to the room, we were ready to start painting. 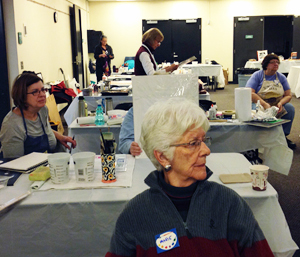 Phyllis showed us how she studies the webbing from all sides until she sees something in it that she wants to paint. From there, it was a matter of laying in watercolors until the image or mood became apparent. Some people added collage to their paintings, giving them another level of complexity. This workshop, like all the rest, gave us a chance to be with other artists, learn new techniques from the instructor and pushed us in new directions. Thanks to Beatrice Drury for organizing another successful workshop!